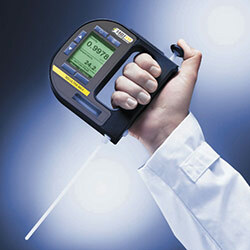 The digital areometer SG-Ultra Max is designed for density determination of different substances. During the measurement process the digital areometer oscillates a U-tube made of borosilicate glass. By filling the tube with the sample substance (min. sample volume: 2 mL) the oscillation frequency of the glass changes depending on the density of the analyzed substance. Thus the determined value is indicated within a few seconds at the display with background lights and can be stored straight on a data storage of the digital areometer SG-Ultra Max via infrared interface (IrDA), in order to export it to a computer or printer. 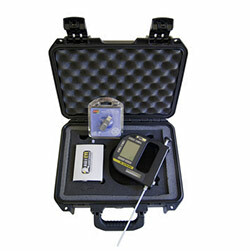 The measurement range of the digital areometer SG-Ultra Max of 0 - 3 g/cm3 is defined in up to 0.0001 g/cm3. Since the density is an index that depends highly on temperature, the digital areometer determines the sample temperature as well, indicates it on the display and determines, in case it is necessary, internally a temperature compensated density value. In order to feature the indicated high accuracy in terms of viscosity (mPa∙s), the digital areometer is characterized by a 99.999 % accuracy. Even its manageability with a compact design, robust enclosure, low weight, integrated pump and the possibility of operating the device with one hand only, qualify the digital areometer as a user-friendly device. The digital areometer SG-Ultra Max can be applied in different areas like for example the food industry, the pharmaceutical or chemical industry for quality and product control. 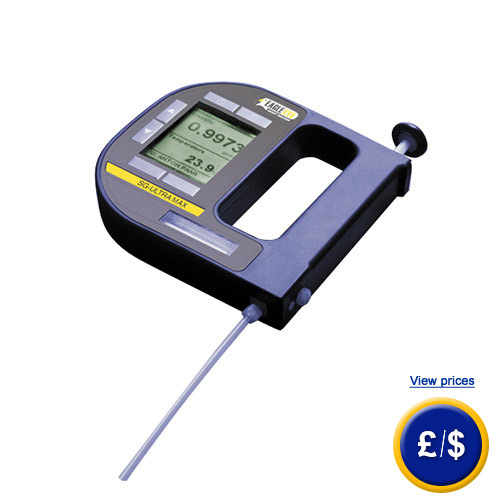 If there are any questions about this digital areometer SG-Ultra Max, please have a look at the technical specification below or call: UK customers +44(0) 23 809 870 30 / US customers +1-410-387-7703. Our technicians and engineers will gladly advise you in all density scales and all products in the field of measuring instruments, regulation and control and scales.